Dreamers, revolutionaries, and escapists, Russian writers throughout the ages have appreciated Crimea as a quiet haven – remote from Europe, the bureaucrats of Moscow, and the sovereigns of St. Petersburg. Alexander Pushkin was among the first to discover Crimea, albeit unwillingly. He was exiled from St. Petersburg to the south for his poems about freedom. However, Pushkin was either too incorrigible or the Crimean air was too heady, because his exile turned into rehabilitation. “Resurrected feelings, clear mind,” he wrote in the poem “Tavrida” (the Greek name for Crimea). Pushkin’s discoveries in Crimea included the poetry of Ovid. He learned that his Roman counterpart was also exiled to Crimea at the behest of a despotic emperor. In his Crimean poems, Pushkin compares his asceticism with the fate of the ancient poet. Maximilian Voloshin, poet, artist, and organizer of the creative commune, was also inspired by this breathtakingly beautiful peninsula. Voloshin personified a certain simplicity and naturalness in Russian bohemia. He also owned a house in Koktebel, where he invited diverse guests regardless of their rank or political views. He challenged his friends (among whom were Marina Tsvetaeva, Osip Mandelstam, Andrew White, Maxim Gorky and Alexei Tolstoy) to abandon the conventions of the day and instead revel in creativity. Crimea’s hot air and the warm welcome of Voloshin’s salon helped poets fight their creative crises. Voloshin became a literary guru for the poet Marina Tsvetaeva, for example, encouraging her to trust the reader and give her imagination free rein. In Crimea, Tsvetaeva visited Pushkin’s favorite places, including Bakhchisarai and Yalta. In her poem “Meeting with Pushkin,” she imagines she is strolling with the “curly magician.” Tsvetaeva has a conversation with Pushkin in the poem, where she suggests they both recoil from the concept of “leader” and embrace the revelation of personal freedom. In 1930, the writer Alexander Grin, another friend of Voloshin, moved to Crimea for health reasons. Green was a great escapist, yet he shunned the “commune” and lived in seclusion. His main source of inspiration was the sea. While living in Crimea, he wrote his most important work, “She Who Runs on the Waves,” a novel about a seriously ill dreamer who is healed by love and travel. 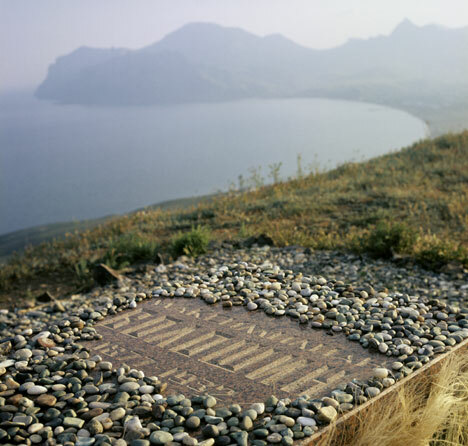 Grin is buried in Old Crimea on a hill overlooking the sea. During the civil war, Crimea was the last foothold of resistance for the White Army. Refugee ships departed from its ports carrying scientists, artists, and writers. 1920, the year of the Bolsheviks’ final victory, was an important milestone for Russian literature. The play "Flight" by Mikhail Bulgakov reflects the last days of old Russia. Crimea was a sort of Noah's Ark in distress. Here White Army soldiers, priests, and aristocrats from St. Petersburg were trying to understand what happened to Russia and how to find their place in the world. The writer Gaito Gazdanov emigrated to France through Crimea. In his novel “An Evening with Claire,” he describes the anarchy on the streets and the trains full of the wounded at the stations. The writer's last impression of his homeland was the hot Feodosian sand flying around refugee ships. Crimea is already lost, but will never surrender. Vladimir Nabokov also emigrated through Crimea. However, he preferred to close his eyes to the disaster and create his own myth. The main character of the short story “Spring in Fialta” (where Fialta is a collective image for many towns of the peninsula – Yalta, Sudak, Kerch), a happy family man, comes to Crimea only to meet Nina – a woman that he befriended in 1917 and whom he flirted with from time to time. Now, she is married. For Nabokov, Nina symbolizes Russia, and 1917 represents the coming changes; inevitably, she is killed in a car accident, colliding full speed with a travelling circus van. In later novels, Nabokov is nostalgic for liberal Eastern European power. The tsar’s palace stands among palm trees, and the tsar contemplates the sea through the window. In Nabokov’s imaginary Russia, Crimea is the ideal place for the capital. Even after the departure of an entire galaxy of writers, Russian literature grew richer, both at home and in exile. Crimea has continued to attract creative people who disagree with the actions of the authorities in Moscow. One of them was the young poet and translator, Joseph Brodsky, a vulnerable man who had yet to win the Nobel Prize or reach an uneasy truce with fame. In Crimea, he found an endearing combination of his favorite elements – wine and the sea, which appear in all of his “Crimean” works. The idea of Crimea’s freedom is probably best expressed in “The Island of Crimea,” a cult novel written by Vasily Aksyonov in the 1970s. Aksyonov went farther than Nabokov ever did, rewriting history and reshaping geography. In this novel, Crimea is an island, not a peninsula, and the Bolsheviks do not reach it until 1920. Unconquered, it becomes an independent state. Crimea is today, and formerly, part of Russia. Recently, it was part of Ukraine. Somehow its destiny as an artistic haven seems more inevitable, and clear, than its geopolitical fate.